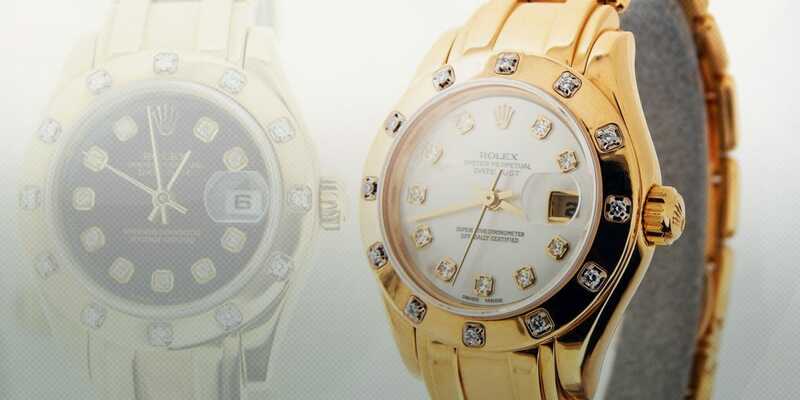 In 1992, Rolex enhanced the women’s Datejust collection with a new version dubbed the Pearlmaster. Positioned as a jewelry watch, the Datejust Pearlmaster is exclusively crafted in 18k gold—yellow, white, or Everose gold—and more often than not, includes diamonds or other gems. Of course, as a Datejust watch, the Pearlmaster flaunts the famous date window and Cyclops magnification lens combination too. The ladies’ Datejust Pearlmaster is, in fact, named after the bracelet that accompanies it. Reminiscent of a high jewelry piece, the solid gold Pearlmaster bracelet includes rounded five‑piece links in varying sizes. Furthermore, the Pearlmaster bracelet is always equipped with the concealed Crownclasp. As with other Rolex dress watch collections, the Pearlmaster offers plenty of variety includes a trio of sizes. Today we explore three different sizes of the yellow gold ladies’ Datejust Pearlmaster. The smallest versions of the yellow gold ladies’ Datejust Pearlmaster models are those with the 29mm Oyster cases—a very wearable size for almost all women. Not too big and not too small. Aside from the assortment of dials, the Pearlmaster 29 offers a selection of bezels too. There are the bezels with just one larger triangular diamond at the 12 o’clock position (ref. 69328), the bezels dotted with 12 white diamonds (ref. 69318 and ref. 80318), and the full diamond-set bezels (ref. 69298 and ref. 80298). Furthermore, there’s also the yellow gold ladies’ Datejust Pearlmaster ref. 69308 with baguette-cut gems with a choice of diamonds, sapphires, rubies, or emeralds. For a bigger version of the yellow gold ladies’ Datejust Pearlmaster, Rolex added the Pearlmaster 34 timepieces to the lineup. Again, there’s a wide range of bezels to choose from ranging from smooth ones (ref. 81208) to ones adorned with a dozen fine diamonds (ref. 81318) to ones with a full ring of diamonds (ref. 81158). For an ultra-lavish edition of the yellow gold ladies’ Datejust Pearlmaster, there’s the opulent Pearlmaster ref. 81388 with two rows of diamonds on the bezel and a Pearlmaster bracelet decorated with a diamond wave pattern. Plus, for those who enjoy colorful gems, the Pearlmaster ref. 81348 dons a bezel embellished with luscious sapphires in different shades of pink. In 2015, Rolex unveiled yet another larger size of the yellow gold ladies’ Datejust Pearlmaster with the new Pearlmaster 39. These particular Pearlmaster models are some of Rolex’s most colorful creations to date. The yellow gold ladies’ Datejust Pearlmaster ref. 86348SAJOR shines bright with a yellow and orange sapphire-set bezel while the Pearlmaster ref. 86348SABLV dazzles with a green and blue sapphire bezel. In addition to the new style of bezels, these two yellow gold ladies’ Datejust Pearlmaster 39 watches are also noteworthy for debuting the new Caliber 3235 automatic movement. The new generation Rolex Cal. 3255 boasts 14 patents, a new Chronergy escapement for increased efficiency, and an improved power reserve of 70 hours. Furthermore, the Cal. 3235 falls under Rolex’s revised Superlative Chronometer Officially Certified standard with an impressive accuracy rating of -2/+2 seconds per day. 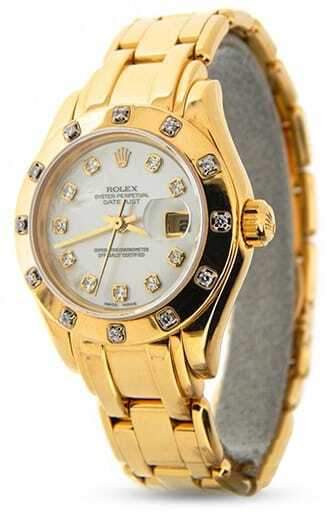 For women looking for the ultimate status jewelry watch, the yellow gold ladies’ Datejust Pearlmaster watches not only dress the part, but are also backed by Rolex’s famous perpetual mechanical movements. Whether in 29mm, 34mm, or 39mm, the Datejust Pearlmaster is a ladies’ luxury watch to fall in love with.